Traditional PCBs and flex circuits share some, but not all, of the manufacturing process steps. For instance, the flex material (usually copper clad polyimide) is selected, drilled, plated, photo-imaged, developed and etched just like the traditional PCB process. The next step, also similar for both PCBs and flex circuits, involves the panels being baked to remove any moisture from the wet processes. It is after this step where the traditional PCB and flex circuit processes begin to differ. Instead of going to the solder mask station, as would happen with traditional PCBs, flex circuits go to the coverlay station. Figure 1. Example of rounded corner instead of angled corners. A flex circuit coverlay, also known as a coverfilm, is a lamination process used to encapsulate and protect any external circuitry of the flex circuit. The coverlay serves the same function as the soldermask does for traditional PCBs with the difference being the added element of flexibility. Typically, coverlay thickness is made of 1 mil thick polyimide with a 1 mil thick attached adhesive, but other thicknesses are available to meet specific design requirements. The polyimide and adhesive coverlay is laminated using pressure and heat. The heat allows for easy flow of the adhesive which is necessary since it must fill-in any and all gaps in between the traces and pads to prevent the trapping of air between layers. To a flex circuit designer this means the coverlay openings for a typical 1 oz. copper design must be oversized by 10 mils, which is significantly larger than the typical oversize of 2-3 mils used on traditional PCB solder masks. There are two reasons for this larger oversize. The first being the tolerance of the drill size(s) and locations; flex circuits usually require a looser tolerance than traditional PCBs because their materials have less dimensional stability. The second reason for larger oversize is to account for the adhesive which squeezes out into the openings. The goal is to have a design such that the adhesive flows out to the pad but never on top of the pad, which affects the size of the annular ring. Once the lamination process is finished any component and/or feature openings are made using drilling, routing, or laser cutting. Etching cannot be used. Flex area, an area of design to consider when designing flex circuits, consists of both the location for where and how often the flexing occurs on the flex circuit. Flex circuits are usually designed for two typical flex applications. The first is referred to as static, or flex-to-fit, which simply means the flex circuit is flexed to fit into the assembly and will flex less than 100 times in its lifetime. The second application, termed dynamic flex, involves the design to not only be flex-to-fit in the assembly but also flexing during normal operation of the application. 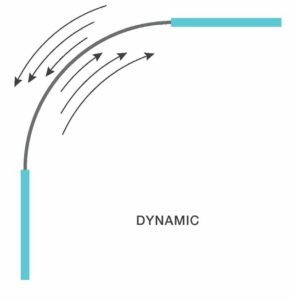 A dynamic flex design must be more robust since flexing will occur on a regular basis. It needs to withstand tens of thousands, or millions, of flexes depending on the application. Either of these two flex applications require some forethought regarding the trace routing and pad placement in the flex area. For example, it is important not to have any components and/or solder pads in the flex area regardless of the design flex type (static or dynamic). The solder joint will be the weakest part of the circuit and it will fail prematurely because solder, whether it’s leaded or lead-free, is rigid and is not intended to bend, flex or twist. It is best to keep all solder points a minimum of 100 mils away from flex areas, although further is better if real estate allows for it. Regarding routing, traces should be routed through the flex areas perpendicularly. This approach takes advantage of the malleability of the copper—rolled annealed copper has grain and, if run horizontally in the flex area, may split or fracture. Although copper is the most common material for traces, specialty metals are also available for specific applications such as corrosion resistance, spring properties, or where radiodensity is desired. 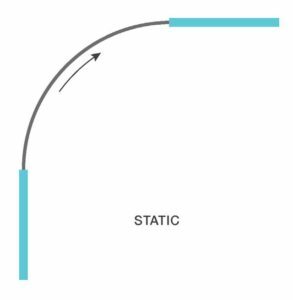 It’s best to route traces at a 90-degree angle through the flex area followed by any necessary direction changes to accommodate the final design. You may utilize CAD tools for both the design and the output of Gerbers files as you would for any traditional PCB, and both the fabrication and assembly drawing documentation is the same between the two design types. However, keep in mind that angles in flex designs are not preferred. Be sure your software design tool is set accordingly such that corners are round instead of angular during the layout phase of your flex circuit. The figure below shows an example of a flex design with rounded corners. Examine sample circuits of similar layer counts to determine if the proposed design will provide the necessary flexibility. Review mechanical requirements to ensure that bend radii are within acceptable values for circuit thickness and layer count (refer to IPC-2223 for bend radius guidelines). 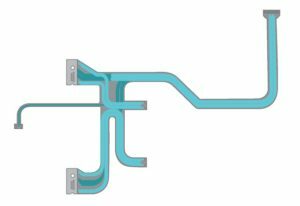 Construct a virtual mock-up of your flex circuit in its formed installed configuration using a 3D CAD package. This allows you to design the proper fitment for your specific application while allowing for visualization of any interference issues. Obtain a mechanical sample to help resolve any fit and/or form concerns. Form refers to the physical size, shape and mass of the part. Fit refers to the environmental interfaces, making it flexible enough to bend for installation. Ask your board house to review your design for possible improvements. Consider using selective bonding, or individual layers that are unbonded and allowed to flex freely. What type: solid or patterned? For what purpose: reduced noise, or controlled impedance for high-speed signal? Will surface-mount parts be used? Will through-hole parts be used? IPC-2221A, Generic Standard on Printed Board Design. IPC-2223, Sectional Design Standard for Flexible Printed Boards. IPC-4101, Specification for Base Materials for Rigid and Multilayer Printed Boards. IPC-4202, Flexible Base Dielectrics for Use in Flexible Printed Circuitry. IPC-4203, Adhesive Coated Dielectric Films for Use as Cover Sheets for Flexible Printed Circuitry and Flexible Adhesive Bonding Films. IPC-4204 Flexible Metal-Clad Dielectrics for Use in Fabrication of Flexible Printed Circuitry. IPC-6013, Qualification and Performance Specification for Flexible Printed Wiring. IPC-MF-4562, Copper Foil for Printed Wiring Applications. IPC Position Paper: Transitioning from MIL-P-50884C and MIL-PRF-31032 to IPC-6013 and Amendment 1. Other IPC standards may apply depending on your design. MIL-P-50884 (inactive for new designs), Printed Wiring, Flexible and Rigid-flex for Electronic Printed Wiring. MIL-PRF-31032/3A, Printed Wiring Board, Flexible, Single and Double Layer, With or Without Plated Holes, With or Without Stiffeners, for Soldered Part Mounting. MIL-PRF-31032/4A, Printed Wiring Board, Rigid- Flex or Flexible, Multilayer, with Plated Holes, with or Without Stiffeners, for Soldered Part Mounting. Other military standards may apply depending on your design. Manufacturing costs should always be evaluated when selecting and/or designing flex circuits. Flex circuits are similar to traditional PCBs in the sense that as their layer count increases so does the cost of the design. So, strictly from a manufacturing point of view, it may be less expensive to use two double-layer circuits as opposed to one four-layer circuit. However, the cost savings of the circuit may be offset by additional assembly requirements. Since each application is unique, it is advantageous to invest a relatively small amount of time in forethought and project assessment regarding these manufacturing issues, which may result in significant project savings overall—think Total Cost of Ownership (TCO). Conductor lengths and widths, space and trace, and materials (copper, copper-nickel, nickel). Hole diameters (both plated and non-plated), and aspect ratio (ratio of hole depth to hole diameter). Hole-to-border tolerances, and pattern-to-pattern tolerance. Bend radius (flexibility) based upon your design’s layer count. Solder type (leaded or lead-free [RoHS]). Surface finish plating (options, method, materials). Electrical characteristics (dielectric and shielding). Flex circuits and traditional PCBs have many similarities regarding their design tools and approaches as well as their manufacturing processes. However, flex circuits consist of many unique elements and intrinsic characteristics which require their designers and engineers to ask specific questions and dedicate forethought to such designs prior to starting the design process. Furthermore, due to different manufacturing process steps involved when making flex circuits, time, energy and money can be either saved or wasted depending on one’s dedication to the research and study. This dedication is required both at the project’s application level and what a manufacturing facility can offer in terms of engineering resources, design guidance, samples, surface finishing options, materials, testing and assembly, circuit types, and board properties in terms of electrical, mechanical, and chemical options. Interested in more design tips? Read our Design Insights Guide.